One of the owners of a Spokane Valley coffee stand that reported vandalism and an arson attempt last week was arrested Friday and charged with second-degree arson. 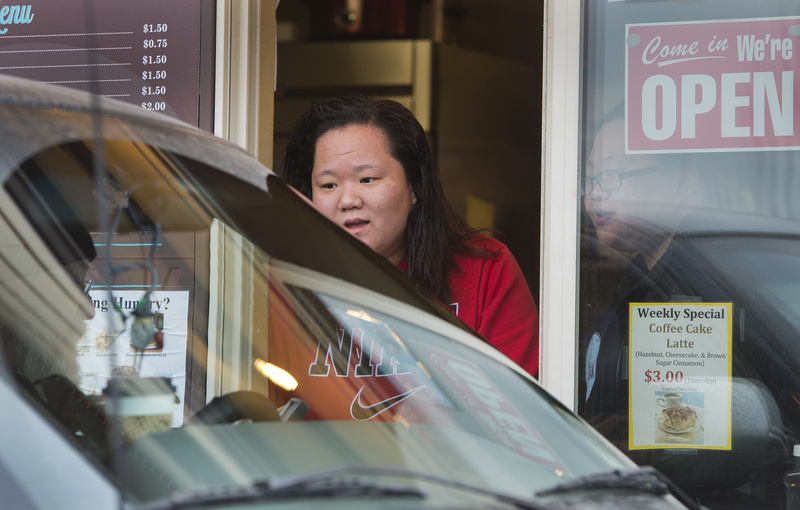 Investigators believe Jennifer Na, one of two sisters who runs the Coffee Break espresso stand, set the fire herself. She is also believed to have spray-painted “Go back to China” on the pavement, which had led to speculation that it was a hate crime. Spokane Valley Deputy Fire Marshal Clifton Mehaffey said surveillance video shows her entering the coffee shop late at night with a gas can in her hand. The video also shows her reaching to unplug the video system, Mehaffey said. Na initially denied setting the fire but then admitted she did it, Mehaffey said. She claimed she had no desire to burn down the building, though gasoline and burned paper were found. She reportedly told Mehaffey that she used to work as a volunteer firefighter with Spokane County Fire District 3 and if she wanted to burn down the building, she would have. Her sister, Diana Na, had no role in the crime, Mehaffey said. “She was very upset,” he said. Why Jennifer Na did it is still not clear, Mehaffey said. She told Mehaffey he wouldn’t understand her reason, but she wouldn’t elaborate, he said. Jennifer Na’s background also raised red flags for investigators. She was charged with first-degree trafficking in stolen property and four counts of second-degree theft last year after allegedly stealing a digital camera from Spokane County Fire District 3 and a wallet belonging to the district’s deputy fire chief. She pleaded guilty to one charge of second-degree theft and was sentenced to one day in jail and ordered to pay $280 in restitution. The Liberty Motel on North Division Street, which is owned by Na’s father, sustained heavy damage in a fire in 2011, but investigators do not believe Na had a role in that incident. That fire started in the bedding in one of the rooms and the cause was determined to be a cigarette dropped by a guest, Spokane Assistant Fire Chief Brian Schaeffer said. “The owners of the Liberty Motel did not play any role … other than calling 911 after the fire was discovered,” Schaeffer said. Na has also been charged with third-degree malicious mischief and false reporting.